Mushroom sales are on the rise as they make up over 2% of organic produce sales. Organics make up nearly 10% of category retail sales in 2015 and that percent should rise in 2016, as sales rose 25% in 2016. Maintaining a well-stocked organic mushroom display in your produce department can add some of those sales to your bottom line. For more information on variety characteristics, visit our conventional mushrooms page. Promote organic mushrooms as a topping for sandwiches and salads. Cross-merchandise them with organic bagged salads and organic meats. Organic portobella mushrooms make a great meat replacement. Promote them to vegetarian consumers who are also environmentally conscious. 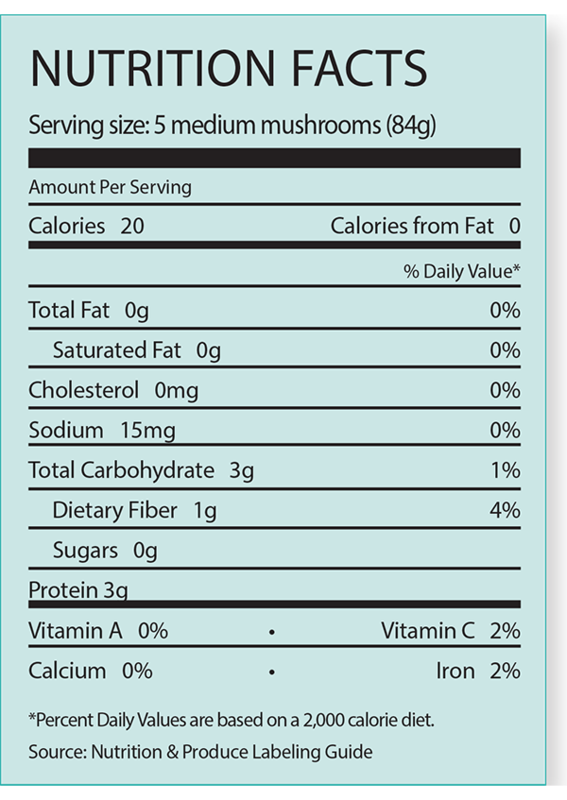 Add organic mushrooms to holiday sales as they are used in many casseroles and salads. Offer consumers a variety of organic mushrooms. The mushroom category offers plenty to choose from, so experiment with different varieties to see what works best in your store. Include sliced organic mushrooms in your display to appeal to environmentally conscious and time-strapped consumers. Consider offering both packaged and bulk organic mushrooms. When thinking about where you want to display organic mushrooms, consider placing them in a section of other organic produce, especially if displaying bulk items. It’s easier to keep the conventional and organic product separate if they aren’t near each other. Packaged products could be more easily displayed with conventional and organic products next to each other as the risk of mixing is less. Organic oyster and Shiitake mushrooms are generally available in 5-pound packs. Other mushroom varieties are available in a multitude of pack sizes similar to conventional mushrooms. Because of a high respiration rate, the button variety requires plenty of air. Mushrooms are sensitive to water. If wet, they will develop wrinkles or brown spots or deteriorate prematurely. Store in original containers. Do not store in non-porous plastic bags as they will accelerate mushroom deterioration. Do not store mushrooms on wet storeroom floors, but rather on a pallet or shelf. Open veils are not a sign of poor quality, but the shelf life will be shorter. Just 7% of consumers who bought mushrooms said they exclusively purchased organic mushrooms. However, another 17% of shoppers who bought mushrooms said they purchased both conventional and organic mushrooms.